17 year-old Tom, who lives on a mixed beef and sheep farm near Northallerton, is a member of Great Smeaton Young Farmers’ Club (YFC). LIt was a case of third time lucky for Tom, as this was his third attempt at entering the prestigious competition. “Rather than give up I picked up all the tips I could from my previous two attempts and really went for it on this, my third go,” explained Tom, who is studying agriculture at Askham Bryan College. “I joined YFC when I was 13 and it was the best thing I ever did. I’m much more confident and it’s amazing to think that I now don’t mind standing up and speaking to a room full of strangers. I’ve done public speaking competitions with young farmers and, for the Junior Member competition, there was a presentation element. You had to say what you’d been up to with your club and also what you’d done, month by month, in your normal day-to-day life. Tom is keen to get more involved with the YFC movement. 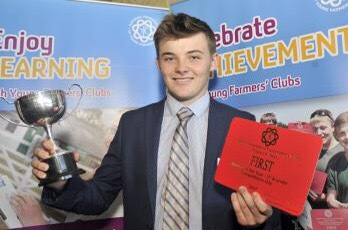 As a result of his win Tom will now join the YFC’s national youth forum, alongside the other six finalists in the competition, and will help to represent the younger members of the federation. “I am always saying to our junior members that they have as much of a say in the running of their club, county and national federation as the older members. When I was younger, I didn’t feel like I had a lot of say in decisions but everyone can and should put their views forward,” said Tom who is assistant secretary of Great Smeaton, as well as sports captain and looking after the juniors for competitions. The other finalists that will join Tom on the national youth forum are: Gemma Owen from Montgomery FYFC, Jessica Elliman from Berkshire FYFC, Peter Cotton from Staffordshire FYFC, Amy Stubbs from Lincolnshire FYFC, Charlotte Scott from Somerset FYFC and Beth Maskell from Suffolk FYFC.